The power modules made by TECHSEM include various circuit topologies such as single- and dual thyristors (MT and MTC Series) / single- and dual diodes (MD and MDC Series), thyristor-diode-modules (MFC Series). 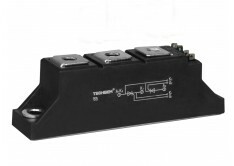 The output current range is from 26A to 570A and the maximum reverse voltage range of the modules is up to 3600V. TECHSEM is the leader in the Chinese power module market. The packages of TECHSEM power modules are in full compliance with international standards, providing excellent versatility and substitutability to customers. 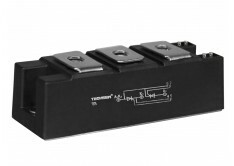 All TECHSEM power modules have CE and UL (file No. E321159) marking and comply with European RoHS directives. TECHSEM products are widely used for motor drives, power supply, power transmission and distribution, railway transportation, metal smelting, machinery manufacturing, welding machines, chemical industry, renewable energy, and other applications in many Industries. In such a module, the thyristors and diodes are fitted together in one module. The module has a housing made of plastic injection molding and is mounted on a metal base plate. This base plate acts within the module as a cooling surface and is completely isolated from the terminals. However, a thyristor itself is already a composition and not just in the origin of the word. The word is a combination of "thyraton" and "transistor". The thyristor, which features as a semiconductor device, has non-conductive properties in its original state. But once the current on the gate electrode has activated the thyristor, it remains in the conducting state, until the current falls below a minimum value. In contrast to a diode, a thyristor in its basic non switch-on state is blocked in both directions and also remains so until a defined ignition voltage has reached in the forward direction. In the reverse direction, thyristors behave like normal diodes, which are completely blocked. A diode in turn allows a current to flow in the forward direction through and is in the reverse direction almost completely isolated. The conductivity of the diode itself is dependent on the polarity of the operating voltage to anode and cathode, and the current flow direction. In combination with one or more thyristors in a module it is similar to a check valve. When a voltage is at a corresponding high level on the diode, it will be turned on in the forward direction, but prevents the current flow in the reverse direction. Where in a check valve the mechanical pressure builds up as the conqueror of the utilized spring force, this happens to a diode and a diode module via the threshold voltage and the minimum forward voltage. Such power semiconductors in thyristors and diodes combined in one module can be used in a variety of applications and offer a power range from a few kilowatts to several gigawatts to meet different requirements. Mostly they are used in the control of phase sections or as rectifiers. They are used not only in the motor drives but also in power transmission and distribution, in chemical industry or built into modern welding equipment.